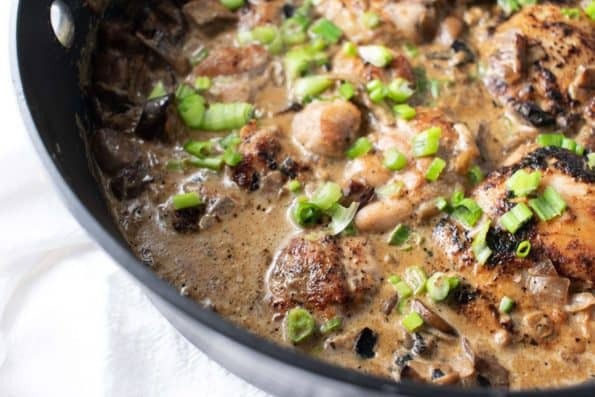 Creamy Mushroom Chicken is a delicious quick dinner made from minimal ingredients of cream & mushrooms brightened with fresh scallion, perfect for any busy workday. If you guys are anything like me right now, you’d pay to have an extra hour every night. It’s easy to let well-intended dinner plans be the first thing that gets ditched and to instead just buy some takeout or make a PBJ. As a quick fix it works great, but usually is not a sustainable habit because it either gets expensive, boring, or unhealthy. Don’t forget to defrost any meat beforehand! In addition to sticking with my solid fall back recipes during hectic weeks, I like to have a plethora of quick, healthy, and delicious recipes on hand. During normal weeks or weekends, I’ll test out something new to add to my collection! 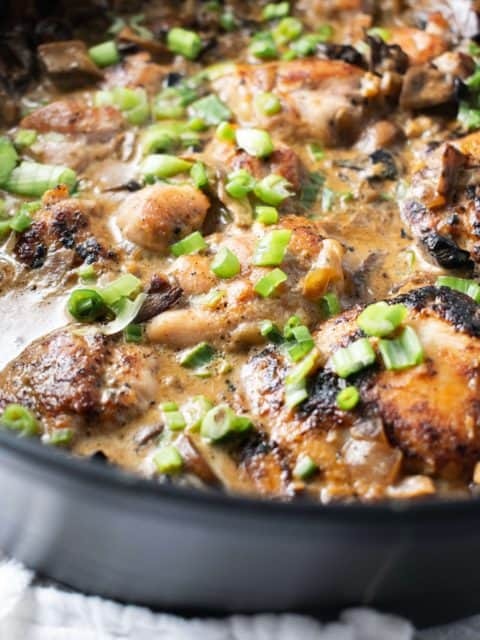 This Creamy Mushroom Chicken has definitely developed into one of my favorite fall back recipes lately. 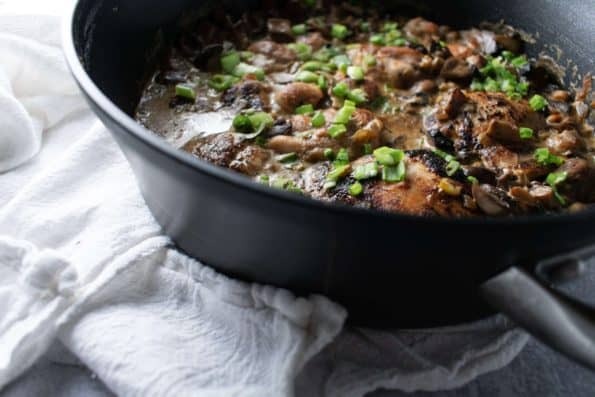 The creamy sauce is tangy, salty, and drenches the chicken thighs entirely so nothing is left dry. The sauce is magically made from 3 ingredients: the browning left from the chicken, cream cheese, & broth. 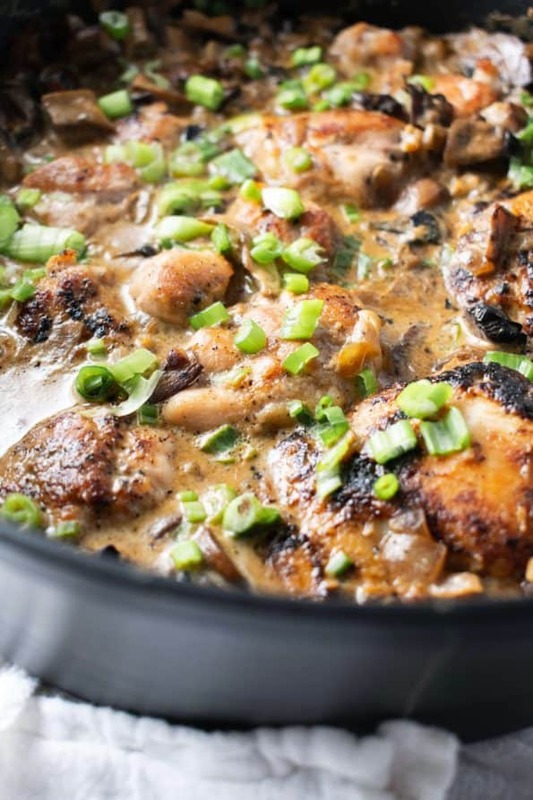 Its seasoned with tons of mushrooms which I am obsessed with, garlic, shallot, and scallions. Mix together your salt, pepper, and onion powder. Pat chicken thighs dry with a paper towel & season with the mixed seasonings. Heat a nonstick skillet on medium heat. Add olive oil & when hot, add chicken. Cook thighs about 3-4 minutes per side until fully cooked and browned on the outside. Repeat for second batch of chicken. Keep warm on a plate while you make the sauce. While the pan is hot, add in both types of mushrooms, spreading them out so they have a chance to brown and not just steam. Sauté for 3 minutes and add garlic & shallot. Cook for another 3 minutes or until mushrooms shrink and everything has browned. Stir all together. Stir in the chicken broth & cream cheese. The cream cheese will be sort of chunky at first, but keep the temperature on medium and it will melt right into it, about 3 minutes. Stir in half and half. Season with salt, pepper, & onion powder to taste. 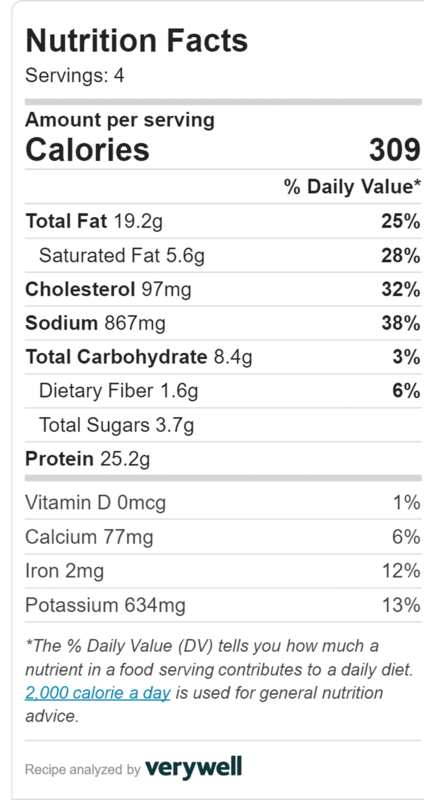 (NOTE: If you didn’t use unsalted chicken broth, skip the salt here). Let come to a simmer. Mix everything together and turn off the heat once the sauce is smooth. Add your chicken back to the pan to cover in the sauce. Before serving, top with scallion. Side dish ideas: salad, sautéed spinach, mashed cauliflower, or mashed potatoes. Great meal with great tips! What more could you ask for?